The vintage Angelic Host Crèche that commands hundreds of dollars. There is no doubt which is the most sought-after paper nativity in the world: the Angelic Host Crèche (shown at left). It and its variations command hundreds of dollars on Internet auction sites. Can you believe that one was just sold for $911.25? And no wonder. Because the artistry of the Angelic Host crèche is hard to beat. There's so much to love about this marvelous nativity: a snow-covered forest scene dripping with icicles; eleven lovely figures, including three sheep; three large arched windows — made up of a myriad openings — lined with red cellophane that bathe the Nativity in soft filtered light; a gold Star of Bethlehem, beautifully embossed, set high above the manger facade. Then there's the pièce de résistance, the angelic host that gently floats by as if on a cloud. This marvelous, magic, mesmerizing angelic procession captivates young and old, commands almost four-figure prices — and is the reason this nativity receives the most interest from crèche enthusiasts near and far. So it may come as no surprise that I started thinking of sharing the Angelic Host Crèche with you by making it available as a Premium Download. But two obstacles stood in the way: one, the tin revolving wheel that you would have to fashion, and two, tearing apart the Angelic Host Crèche so I could scan, color-correct, and repair the damage to the art caused by the intervening decades. 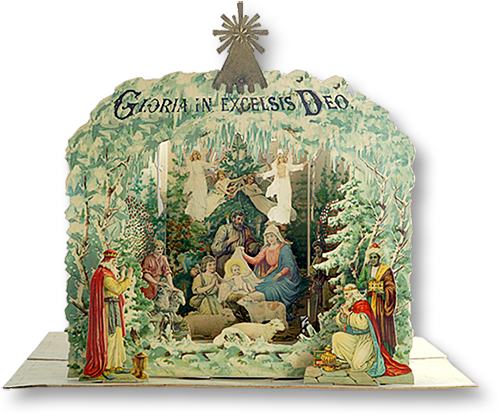 The Raphael Madonna Crèche Christmas tree was a clue to a shared provenance of this nativity with the Angelic Host Crèche. The first obstacle was overcome when my buddy, the crèche collector Celso Rosa visited from Brazil, took back a tracing of the revolving wheel and cut one out of tin. I was thrilled to see his video of his revolving wheel that made whole his incomplete nativity, and it gave me the resolve to do the unthinkable — tear apart a beautifully preserved crèche. Oh, the sacrifices one has to make for his crèche enthusiast friends! The many hours spent working on the Angelic Host Crèche on my computer gave me a new appreciation of its art. And made me realize that I had seen some of the same elements before. Take the Raphael Madonna Crèche (shown at left). Do you notice any similarities with the Angelic Host Crèche? The Christmas tree behind the Madonna and Child is identical in both nativities. And so began a search through my collection that unearthed five other seemingly diverse crèches by the same artist. So great was the German artist's ability for invention that at first glance these crèches do not look alike, but a closer look would reveal a Magi here or a kneeling shepherd there identical to ones in the other nativities. 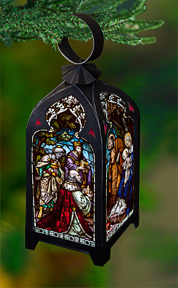 Now that I had so many beautiful figures to choose from my thoughts turned from making an identical Angelci Host Crèche to one that I would design by incorporating all these wonderful figures. And when my friend Tony gave me a musical clock, another idea entered my mind. A King of the East and his attendant from a different nativity were incorporated into the Angelic Host Crèche 2. And so the Angelic Host Crèche 2 was born. Please take a moment and watch the video at the top of this page so you can see how Tony's clock motors replaced candle power. And the clock's computer board provided the lovely music-box carols and light effects. 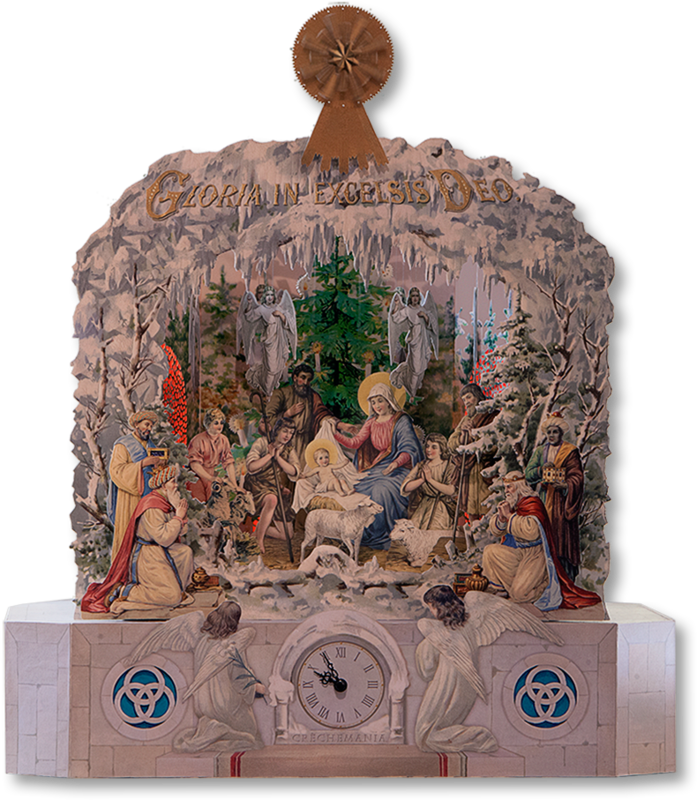 Using the white stones found on the floor of the vintage nativity I shaped a new octagonal base and decorated it with elements from the Raphael Madonna Crèche, like the kneeling angels that flank the clock. 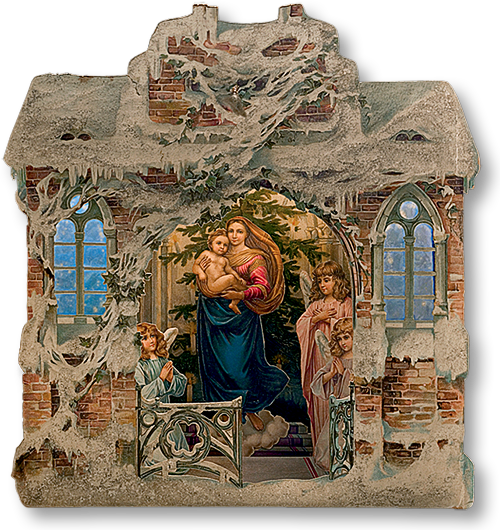 The snow-covered clock-face niche was fashioned from a window of the Raphael Madonna Crèche, and the clock's Roman numerals were created with one of my favorite fonts, Charlemagne. 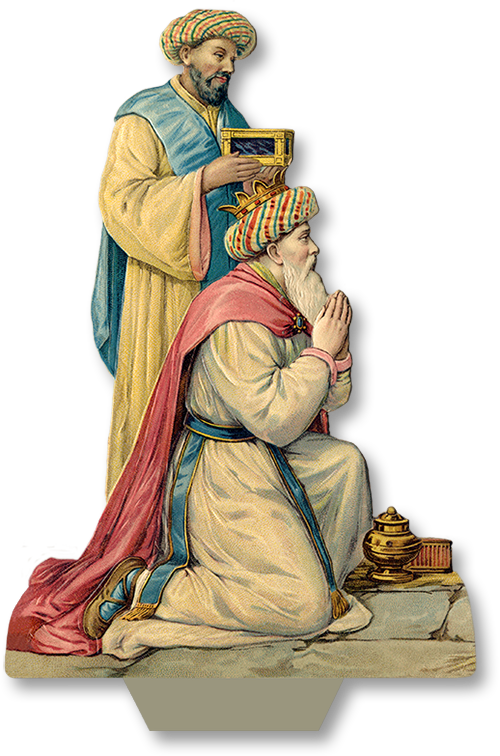 The standing Magi at the left of the vintage nativity was replaced by the kneeling magi and attendant shown at left, as was the young shepherd boy to the left of the Mother and Child. If you compare the vintage nativity at upper left to the Angelic Host Crèche 2 shown at the bottom of the page you'll see that the original crèche features the same sheep twice: once wight he shepherd boy I just mentioned, and once by itself in the center of the manger. I placed the shepherd boy with this sheep at the right of the manger, just behind the standing shepherd, and I replaced him next to the Child by another shepherd holding a long crook from a different nativity. You'll notice that even the Angelic Host is different in the two nativities: the Angelic Host Crèche 2 features angels whose bluish coloration more suites the icy blue hue of this crèche. Since there was another slowly-revolving clock motor I used it to animate the Star of Bethlehem that crowns the nativity. A number of small LEDs flickered on-and-off on the hour as the clock struck its tune, and my first thought was to make place some of them in the center of each Christmas tree candle. But I realized that the LEDs were too large for this, so the idea came to me to create an optic cable halo around each candle flame. While this might sound like a brilliant idea, it proved an almost daunting task. First I had to locate enough tiny optic cables, and then bundle them together so they could each LED could light them up. So many optic cables — that have a mind of their own due to their small length — almost proved my undoing. But I persevered, and you will notice in the video a flickering halo of light surrounding each candle. A carriage riding on brass "rails" conveys each group of Magi to-and-fro. Apart from the signature revolving angelic host I wanted additional movement during the prelude that plays before the revolving angels begin to turn. 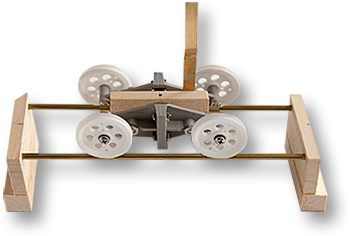 The carriage shown at left, made of parts from Tamiya's Pulley Unit Set, riding on brass rails was the answer. But how would I get each Magi group to move towards each other? In other words, since I only had one motor for this task, how would I mirror their motion? The answer, when it came, proved quite simple. I had to abandon complex thoughts of "translating rotary into linear motion," and simply offset each belt that peoples the Magi so that the ones at the left are set in motion by the bottom loop, those at the right by the top loop. So elegantly simple, when you think about it, but it took me a few hours to come up with this solution. Now that I had animated the Magi, I set about thinking about animating the two angels shown attached towards the top of the Christmas tree on the original nativity. After all the work I had done on the optic halos I just couldn't glue these angels over them! The solution? Silk thread that rides over the smallest Tamiya wheels that raises and lowers the twin angels in time to the music. A brass piece inserted between the front and back of a revolving angel gives weight and stability, assuring a smooth flight. The revolving wheel and angelic host. It occurred to me that since the revolving wheel no longer needed to be aerodynamic that it could be beautiful. And so I chose a snow flake, cut out of heavy white cardboard to support the revolving angels, as shown at left. But before each angel front and back was sealed, I inserted a short piece of brass to give needed weight, and insure a smooth flight. 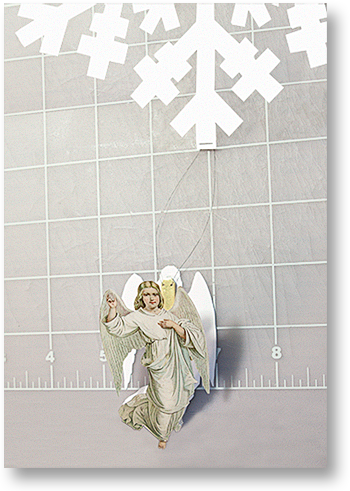 The latter was aided by the use of fine fishing line that attaches each angel to the snowflake. The fishing line may be almost invisible, yet has rigidity, preventing a jarring angelic moments as the wheel revolves. And the fishing line runs from the head of each angels through the snowflake and back, allowing for fine adjustment so that each angel hangs perfectly straight. With the completion of the revolving wheel and angels only one more thing remained before the Angelic Host Crèche was complete: cut out the myriad of holes in the there arched windows on the sides of the manger. It might have taken me three days, but, after red vellum was attached to the back of each window and a drip of LEDs attached there as well, each tiny cut was worth it: the vellum fills the manger with ethereal light, and the gold, red, and green LEDs provide faint flashes that delight the eyes as the musical accompaniment the ears. What about that Premium Download? What ever happened to the Angelic Host Crèche Premium Download you might ask, as my friend Celso has done? It's still in the works, but it got placed on the back burner amidst all the excitement of the Angelic Host Crèche 2. And, one of these days it just might be available on the The Paper Model Kiosk. For a lot less than $912.25. A still shot does not do justice to the Angelic Host Crèche 2, so you'll have to watch the video at the top of the page.